There was no major Hollywood movie playing in Indonesian theaters this week, as Deadpool 2 looming to premiere next week. But there was a new movie shown only in Cinema 21 chain which started since yesterday. Not a lot of theaters playing it, but at least the movie did play in 2 of my favorite theaters. I saw this one by myself as my wife was doubtful about the quality of it. So let's see if her doubt was justified, shall we? Movie was set in the year 2048 where it was revealed that due to over population, the earth would not be humanely inhabitable in the near future. And the idea to resolve this was to move the people to the biggest moon of Saturn planet, called Titan. However, since the planet's atmosphere and condition was impossible to live, a group of scientists under NATO, led by Professor Martin (Tom Wilkinson - In the Bedroom, Michael Clayton etc) and his assistant Dr. Freya (Agyness Deyn) wanted to enhance the people's body to adapt to Titan's condition. They experimented on several candidates who volunteered for this project. Rick (Sam Worthington - Hacksaw Ridge, Avatar etc) was a veteran hero and one of the volunteers for the experiment, so he could ensure the safety & future of his wife Abigail (Talor Schilling - Argo, Orange is the New Black TV series etc) and their son Lucas (Noah Jupe - A Quiet Place, Wonder etc). Among the volunteers, there was also Tally (Natahile Emmanuel - The Fate of the Furious, Game of Thrones TV series etc) and several others. During these experiments, every volunteer would be given various shots and medical procedures which would ultimately make their bodies change. So could this experiment be successful and path the way for people to move to Titan? Or would it backfire? You can find them all in this science fiction drama movie. Well I got to say that this movie was not what I expected. When I saw the trailer, it seemed interestingly thrilling and promised a rather intense science fiction movie in space. But it turned out that the movie was more like a drama. The first half was moving at a very very slow pace. It made me feel I was watching a family drama. The thing is, the story at first revolved around the family of Rick and their struggle to adapt to the experiments, then the story evolved a bit more about the experiment and what it did to Rick (and other volunteers). Only in the last half hour the movie became a bit intense. For a movie categorized as science fiction thriller, I felt there was no thrill. No intensity whatsoever and no intriguing plot. It was just a simple story of a person's transformation into something rather monstrous. It's actually rather a pity coz the plot was pretty nice and perhaps if the focus was not only on the transformation (and the location was not almost entirely on earth), but rather the "colonization" into the Titan, then perhaps it would be a lot more interesting. But that's not the case. Even if we focus on the drama, there was not a lot of emotional moment or touching moment, apart from a very brief time towards the end. So the movie felt lacking everything. It was neither suspenseful & thrilling nor dramatic enough. The only quality that I can see in the film was the moral message which to my personal opinion was about not playing with nature & let evolution be evolutionary rather than forcing speedy revolution. When I searched more about the movie in the internet, I found out that this movie was distributed by Netflix and was shown through that channel in some countries (Indonesia excluded). And I also noticed that it was already available through online streaming. Hence if you are able to access it, my suggestion would be to see it through internet and not having to spend money on tickets. My wife was lucky enough she did not see the movie with me as I am very sure she would have been totally bored. Even I fell asleep for few seconds more than once, especially during the early part. I think the lack of sound & interesting scenes also contributed to that. 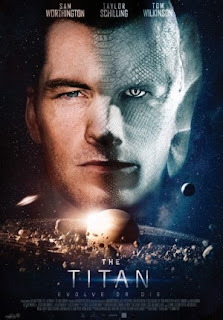 I actually felt a bit sorry for Sam Worthington who was the main cast of the movie, as I could not remember him having the best of luck being lead cast in action movies aside from of course Avatar (I look forward to those sequels though). As for the other cast, I was only familiar with one or two smaller roles, despite few of them were pretty well known. The director Lennart Ruff had never directed a full feature films, which probably translated to the lack of intensity required in science fiction thriller movie. Overall, I did not have the best of time watching this and based on the low ratings by critics and audience, I guess I was not alone in my opinion. If you are looking for science fiction thriller or movies that have lots of thrilling moment with great special effects then you better look elsewhere, But if you prefer more drama, then you can opt to see this. But as I said above, you probably would be more satisfied if you could watch it online since it is a TV movie afterall. The choice is yours.